Take a look around and put that nose to work!! Fun Games For Forum Members! This area is where you can post bios about characters not in the 101 Dalmatians universe. A board for new ideas and planning things. You want to hold a party, a chat room get together, an event? This is the place to put it together! Have a suggestion or an idea for the board? Throw it up here! 141 3,235 Who's your favourite spotted dog? Talk about any characters from the show. Or post your own 101 Dalmatians fan character! 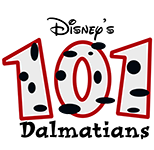 101 Dalmatians Games For Forum Members! Put pictures up from the show and make funny captions. 126 1,297 Power To The Puppies screenshot collection. Here you can post your reviews about movies, tv shows, or books. For our very talented artists. Post RP's that you and your friends do. Show us your creativity with your humorous captions! New Here? Introduce yourself here! Express yourself if something is wrong, or you have a problem with something. Talk in here about any sort of collection you have going on, 101 D related or not. Wish "Happy Birthday" to members here. 452 4,578 Bishop's Full Moon Birthday! 0 Staff, 0 Members, 16 Guests. 2 Staff, 12 Members, 318 Guests.